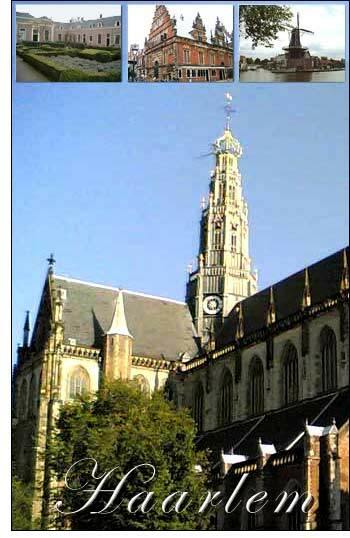 The city of Haarlem is the capital of the province Noord Holland (North Holland) in the west of the Netherlands. It is famous for being the centre of the flower-growing region of Holland, exporting flowers and bulbs, especially tulips. In the 11-13th century Haarlem was the residence of the Counts of Holland. Its hasty participation in the rising against the Spaniards resulted in a most calamitous siege; after a heroic resistance of seven months (1572-1573), in which the women shared, the town was taken by the Spaniards under Frederick of Toledo, son of the Duke of Alva. The commandant, the entire garrison, the Protestant clergy, and 2000 of the townspeople were executed. Four years later the Spaniards were again expelled. Haarlem attained the height of its prosperity in the 17th century, when its school of art also was of some importance. Hendrik Goltzius, Frans Hals, Jacob van Ruysdael, Allart van Everdingen, the three Wouvermans, Adriaen and Isaac van Ostade, and other painters dwelt here at that period; and at the same time there flourished a school of architecture, founded by Lieven de Key (ca. 1560-1627), the city-mason of Haarlem, which was responsible for many of the old gabled houses as well as the public buildings of Haarlem. Haarlem is famous for its Horticulture and supplies bulbs to every country in Europe, North America and the rest of the world. About the end of April and the beginning of May whole fields of hyacinths, tulips, crocuses, anemones, lilies, etc., grouped in every variety of colour and diffusing the most delicious perfumes, are seen around the town. In 1636 and 1637 the flower-trade in Holland assumed the form of a mania, and tulips became as important an object of speculation. Capitalists, merchants, and even private individuals entirely ignorant of floriculture, traded extensively in bulbs, and frequently amassed considerable fortunes. The rarer bulbs often realized enormous prices. It is recorded, for example, that a "Semper Augustus" was sold for 13,000 florins, an "Admiral Liefkens" for 4500 florins, a "Viceroy" for 4200 florins, etc. A single Dutch town is said to have gained upwards of 10 million florins by the sale of tulip-roots in one year, and a speculator at Amsterdam realised 68,000 florins in four months in the same manner. At length, however, a corresponding reaction set in. Government declared that the contracts made were illegal, and the mania speedily subsided. The prices fell so rapidly that many of the bolder speculators were totally ruined, and before long a root of the highly­prized "Semper Augustus" might be purchased for 60 florins. Read more about tulips and holland: tulip history. About a century later a similar phenomenon occurred in the trade in hyacinths, and an official list of 1734 prices a "Bleu Passe non plus ultra" at 1600 florins. In the 17th century's Golden Age Haarlem's linen and silk became world famous and the city flourished. In that period Haarlem's cultural life also prospered, with famous Dutch painters like Frans Hals and Jacob van Ruisdael. In the middle of the town, reached from the handsome railwaystation in about 10 minutes, by a route crossing the Park Laan and the Nieuwe Gracht, is the Groote Markt, in which stand the Saint Bavo Church, the Stadhuis, and the Meat Market.